Anthony Horowitz is the #1 New York Times bestselling author of the Power of Five, Alex Rider and The Diamond Brothers children’s series as well as numerous other novels and short fiction. He has also written extensively for television including Foyle’s War, Midsomer Murders and Collision, and adapting many of Agatha Christie’s Hercule Poirot novels. 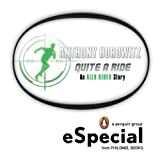 Here’s Anthony Horowitz’s website. CLICK HERE FOR MORE BOOKS BY ANTHONY HOROWITZ. Alex Rider — (2000-2011) Young adult. Publisher: They told him his uncle died in an accident. He wasn’t wearing his seatbelt, they said. But when fourteen-year-old Alex finds his uncle’s windshield riddled with bullet holes, he knows it was no accident. What he doesn’t know yet is that his uncle was killed while on a top-secret mission. But he is about to, and once he does, there is no turning back. Finding himself in the middle of terrorists, Alex must outsmart the people who want him dead. The government has given him the technology, but only he can provide the courage. Should he fail, every child in England will be murdered in cold blood. The first in a thrilling new series by British writer Anthony Horowitz, Stormbreaker will have pulses racing from start to finish. Stormbreaker: What more can you want? 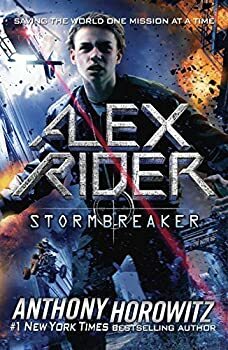 After a friend recommended the Alex Rider books, and the movie adaptation pricked my interest, I settled down with Stormbreaker, the first of what is (currently) a nine-book series. Alex is a fourteen year old English schoolboy who wakes early one morning to find that Ian Rider, his uncle and guardian since his parents' deaths, has been killed in a car accident. It's not long before the truth emerges: Ian wasn't a banker at all, but a high-ranking spy for MI6 who was killed in the line of duty. Now Alex himself has been asked to fill his uncle's shoes, as a lifetime of mountain-climbing, foreign languages, martial arts training and other unusual activities suddenly becomes clear to the young teen. 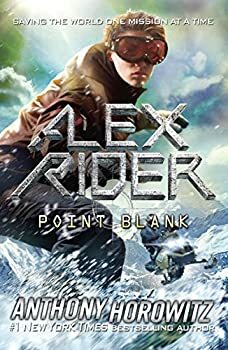 I read the first book in the ALEX RIDER series (Stormbreaker) several years ago, and since I enjoyed it so much, I've no idea why it's taken me this long to get to its sequel: Point Blank, named for the elite boarding school high in the French Alps. Here the troubled sons of millionaires are sent in order to be tutored in isolation, away from any bad influences, though MI5 is concerned when two of the students' fathers are found dead in unusual circumstances. Surely it can't be a coincidence? FORMAT/INFO: The House of Silk is 304 pages long divided over a Preface, twenty numbered/titled chapters, and an Afterword. Narration is in the first person, exclusively via Dr. Watson. The House of Silk is self-contained. 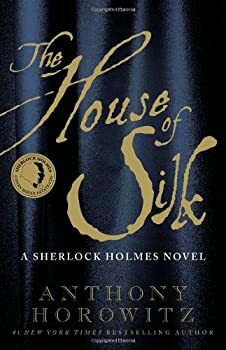 November 1, 2011 marks the North American Hardcover publication of The House of Silk via Mulholland Books. The UK edition (see below) will be published on the same day via Orion Books. I really love Sherlock Holmes. I’ve read all of the original stories, several literary adaptations, and regularly watch not only the BBC but also the American television show, both of which are great (gonna talk smack about Elementary? Come at me, bro!). Last year I had the privilege of teaching an entire class on Holmes and Holmes adaptations. Sherlock himself is such a fascinating character that he is the “most portrayed” character in TV or film. So it disappointed me that I didn’t like Anthony Horowitz’s book, Moriarty, more (or much at all), especially given the fact that only Horowitz’s books bear the stamp of approval from the Conan Doyle estate. Pentagram — (1983-1989) Young adult. Publisher: Thirteen-year-old Martin’s new life with a foster mother on a Yorkshire farm quickly becomes a nightmare where evil and unbelievable happenings seem to threaten his life. Power of Five (The gatekeepers) — (2005-2012) Ages 9-12. This series is called Power of Five in the UK and The Gatekeepers in the US. Publisher: Matt has always known he has unusual powers. Raised in foster care, he is sent to Yorkshire on a rehabilitation programme, only to find himself in the midst of sinister goings-on. Matt investigates and uncovers a terrible secret — eight guardians are protecting the world from the evil ones, beings banished long ago by five children. But devil worshippers want to let the evil ones back in. As the story reaches its climax, it looks like Matt has succeeded in stopping them… or has he? Legends — (2010-2012) Ages 9-12. Publisher: King Arthur would have been just another king if he was content to just sit at home. And Rome would never have been founded if Remus had won the famous battle instead of his brother. Battles and quests are the lifeblood of mythology, and this collection thrusts readers right into the heart of some of the best (and bloodiest) adventure stories from around the world.